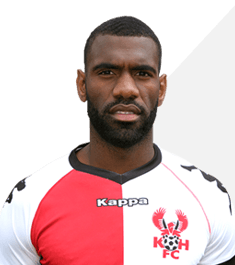 Ghanaian born Daniel Nti signed for the Harriers following his departure from York City by mutual consent. He’s no stranger to Aggborough having played here while he was with tenants Worcester City for two seasons. They signed him from the Loughborough Sports University where he was a regular in their football side and in his time there racked up 49 goals. At City he continued to be a prolific marksman with 44 goals in 130 games. By coming to Aggborough he re-joins two of his old mates at City – Matt Gardiner and Wayne Thomas.